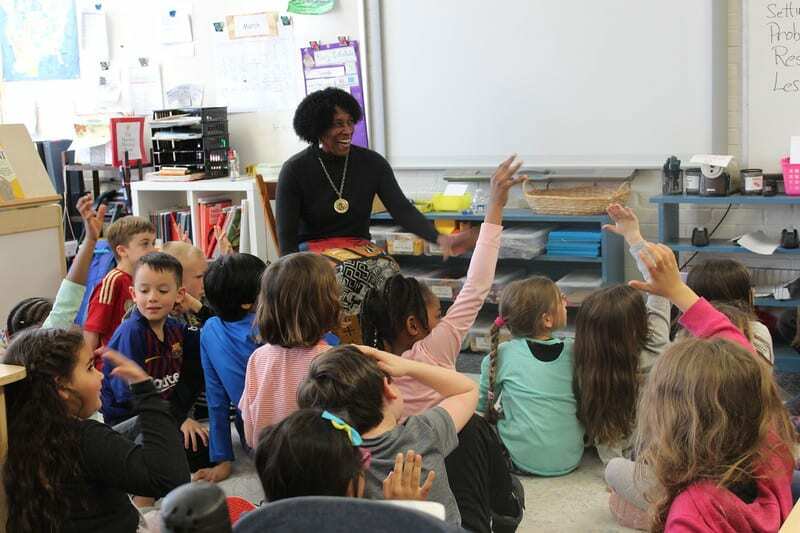 On Tuesday, March 19, Charlotte Blake Alston – a master storyteller with over 29 years of experience – visited the Lower School for a series of assemblies and in-class workshops. Charlotte hosted two presentations (one for Preschool/Pre-K students and another for K-4 students) that combined music, stories, and cultural history. She created sound effects with instruments to enhance each story’s immersive qualities; for example, during a folktale about the tides of the ocean, she ran her fingers along a drum to simulate the sound of rushing water. She later brought out an mbira (“thumb piano”) and sang a song in Chichewa (one of the most commonly spoken languages in Malawi), then translated the lyrics and explained its meaning. Throughout the morning and afternoon, Charlotte visited individual classrooms for storytelling workshops. In the second grade workshop, she discussed the most important building blocks of stories – including Characters, Setting, Problem/Challenge, Resolution, and Lesson/Takeaway – and illustrated how these qualities were woven into the stories she told at the assemblies. She also demonstrated storytelling tools, such as vocal dynamics, body/facial expressions, and word emphasis, through a series of interactive exercises that got students moving and laughing. Charlotte finished each workshop by telling a story in two different ways: the first was a dry, straightforward recap of an event, and the second included vivid details and vocal inflections. Students enjoyed a discussion about the elements that made the second retelling more exciting and entertaining than the first. Charlotte has performed in venues across North America and the world, including the Kennedy Center, the Smithsonian, the Kimmel Center, the Women of the World Festival (Cape Town, South Africa), and more. Click here to read a biography with more details about Charlotte’s work.